A review of common problems addressed by Orthodontists. An overbite occurs when the upper teeth are too far in front of the lower teeth. It can be due to a large upper jaw, a small lower jaw, protruding upper teeth or a combination of these factors. Orthodontists call this a class II problem. Typically the jaw growth pattern is inherited, but can be worsened by habits such as thumb-sucking. The upper front teeth are more prone to trauma in this position. Underbites (a class 3 problem) occurs when the lower teeth bite in front of the upper teeth. The lower jaw may be too large and / or the upper jaw may be too small. Underbites are usually inherited. Crowding usually stems from a discrepancy between the space available in the jaw and the size of the teeth. 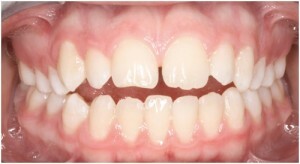 Aside from appearance, crooked teeth may be associated with gum problems and a higher risk of decay due to difficulty in cleaning. Like crowding, generalized spacing may be related to a tooth-to-jaw size disharmony. 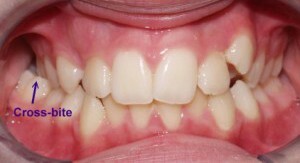 Localized spacing can be caused by protrusion of front teeth, or prominence of the fleshy tissue between the front teeth. Other contributing factors include unusually narrow teeth and missing or impacted teeth. In a deep bite, the upper front teeth cover most or all of the lower front teeth. 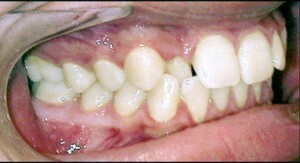 Sometimes the lower front teeth may even touch the roof of the mouth and cause trauma to the gum. 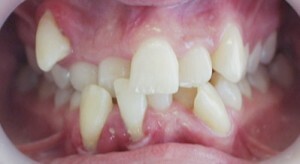 Excessive front tooth wear is a common consequence of an untreated deep bite. Deep bites can also cause gummy smiles and jaw joint pain. In an open bite, there is an opening between the upper and lower teeth. This condition may exist in the front teeth, in the back teeth, or in both. Tongue thrust, speech problems, allergies, and breathing difficulties might be the cause of an open bite. An open bite can make eating more difficult, such as taking a bite of a sandwich. 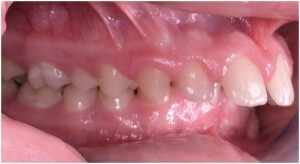 Crossbite can occur in the front and/or the sides of the mouth. It is when one or more upper teeth bite on the inside of the lower teeth. 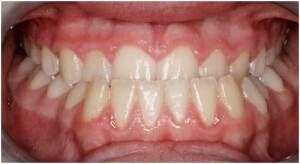 This can occur with a single tooth as seen in the photo above left. 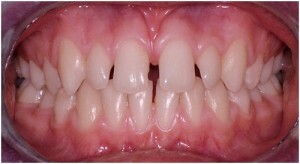 This could also occur with a group of teeth, such as in the photo above right. 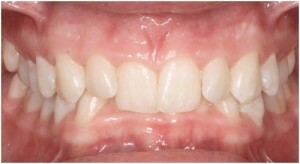 Early correction of crossbite is almost always recommended.